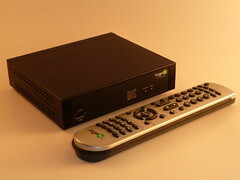 The SageTV HD Theater (HD200) is best know for its ability to act as an extender for the SageTV HTPC software and secondly as a stand-alone media player. 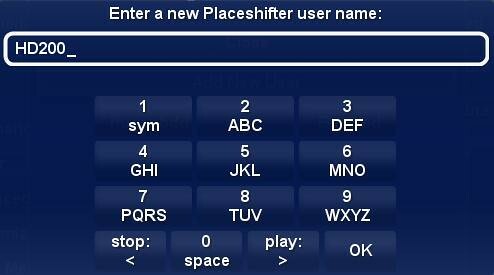 One capability that is less often talked about is it's ability to placeshift. In other words, take your HD Theater with you on the road, plug it in to the web and placeshift (think Slingbox) the SageTV media from your home server across the internet onto the TV in that "remote" location - all with the same familiar interface and with the infrared remote control controlling everything. I personally haven't tried this yet, but hope to over the Independence Day Holiday. Fortunately we have a guest post by Dave who walks through the steps involved. NOTE: This is a guest post by Dave, a GeekTonic reader and SageTV user. Basic guidelines for writing and submitting a guest post at GeekTonic can be found here. Summary: Setting up and using the HD200 as a placeshifter. Scenario: Vacationing in a location with Highspeed wireless only. Server Setup: WHS, Q6600, 3gigs Ram, 20m Cable Connection with 1.5 up, HDPVR, HD-HomeRun, Sage 6.5.9 (yes I know it's old). HD200: Wireless connection through laptop with 1200Kbs down through Internet Sharing Services on Vista. Description: Leaving for vacation I brought the HD200 with me in order to watch my "local" channels back home and our recorded TV. I have also brought a USB drive filled with recordings. I have found that the HD200 does work as a Placeshifter, but the quality is comparable to a YouTube video, pixilated. There also appears to be issues with comskip enabled on some shows. I had to turn "global" comskip setting to off. The quality also means that I will just watch the shows on the USB drive as they are all "HD" and just watch the "news" and listen to music. The kids, however, won't mind and can still watch their cartoons. One issues, seems to be that the newer firmware 6/11 doesn't like to send audio through with the older 6.5.9 version of the sagetv server. I will be updating my sage server when I get back from vacation to test if this is resolved. 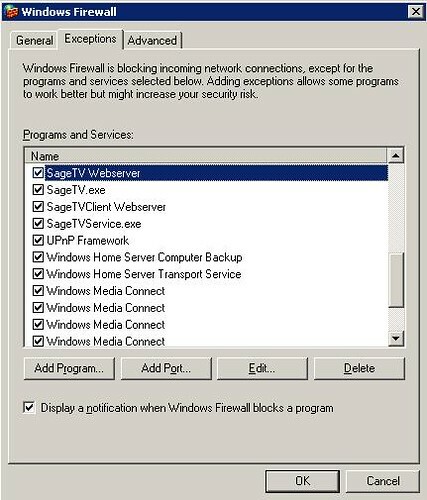 Verify the users is "enabled"
Click Edit for each SageTV service. 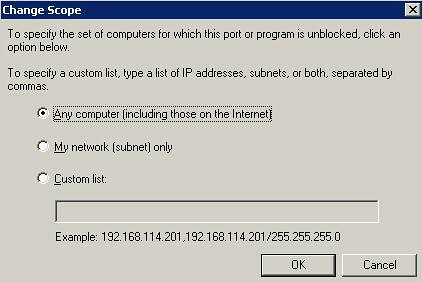 Verify the scope is set to "Any computer (including those on the Internet)"
Enable your "Internet" Firewall on your router. 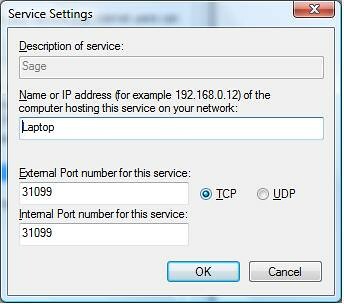 Port 31099 tcp/udp forwared to your sage box. Forward to the internal IP address of your internet connection. 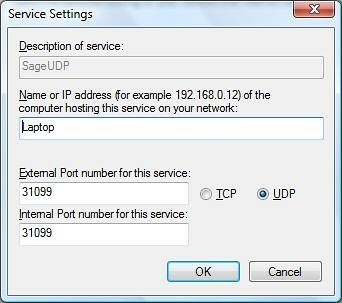 Note the IP address of your internet connection. This can usually be found in the "status" section of your router. Enter Your "Locator" address if you have this information. ICS - Internet Connection Sharing. Since the place I'm staying at for vacation only has Wireless internet for a fee, I have enable internet connection sharing in Vista and run a cable from the laptop to the HD200. 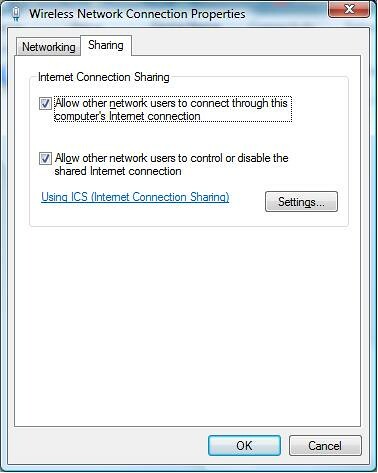 Enable ICS (Allow other network users to connect through this computer's Internet connection) then click on the "Settings" button. 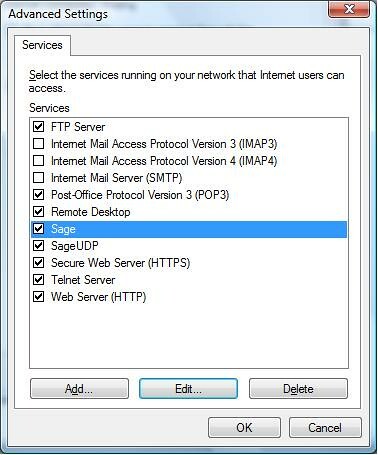 Once at this screen hit "Add"
Load the sage server you setup with the "external" IP address. Hint: Press the pause button to bring up the standard sage text entry menu. 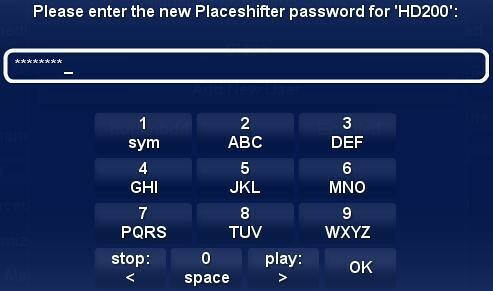 use pause to toggle between capital/lowercase/numbers menu. You are now at your server. Load any themes etc that you normally would. 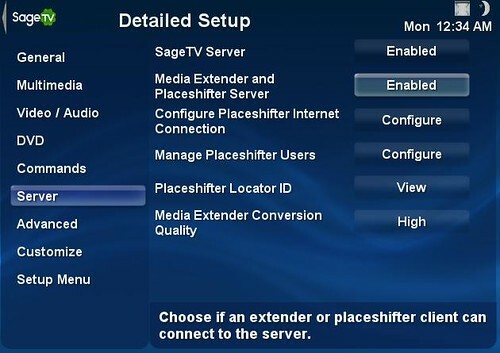 As Dave mentions above it's important to set up placeshifting on the SageTV server before you leave for your trip. About the author: Dave who goes by the screen-name "hugenbdd" on the SageTV forums is a reader of GeekTonic and SageTV user. He's been involved with home theater issues for over eight years. Dave started using HTPC's with Windows MCE 2005 with two Xbox 360's as extenders and says "I finally saw the light with SageTV this February." If you would like to write a guest-post for GeekTonic, please read these basic guidelines for writing and submitting a guest post at GeekTonic can be found here. Have questions about the HD200 placeshifting process? Ask Dave or I in the comments below.